Perfect for Star Wars fans who think they already know everythingOn May 25, 1977, the world of science fiction, film, and pop culture was changed forever with the release of Star Wars. The beginning of this epic space opera franchise would inspire an expanded universe of creativity, including books, comic books, theme parks, and much more. With extensive back stories, lore, and author Dan Casey's encyclopedic knowledge on the subject, this lively, detailed book explores the characters, storylines, and facts every true Star Wars fan should know. This guide covers the history of how a multibillion-dollar and beloved institution was born and went on to flourish. Dan Casey has collected every essential piece of Star Wars knowledge and trivia, including what infamous, cult classic TV movie introduced beloved bounty hunter Boba Fett, what Star Wars novel was released in 1976 before the first movie premiered, and what animal species is named after Han Solo. 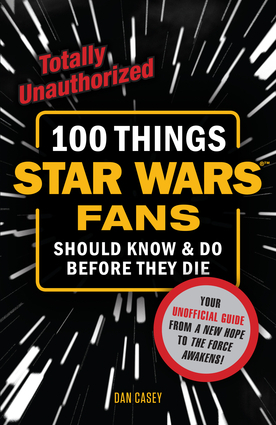 Whether you're a fan of the original film trilogy, an avid reader of the books, or can't wait to see what J. J. Abrams does with the next generation of movies, 100 Things Star Wars Fans Should Know & Do Before They Die is the perfect resource for all Star Wars fans looking to increase their knowledge of the storied franchise and look back on the most memorable moments of a galaxy "far, far away." Dan Casey is a critic, a commentator, and an on-camera host who has appeared on Nerdist, StarWars.com, TOKYOPOP, McSweeney's Internet Tendency, as well as FOX News' Tech Take, AMC Movie Talk, and the Young Turk's Nerd Alert. He is the author of 100 Things Avengers Fans Should Know & Do Before They Die. He lives in Los Angeles.